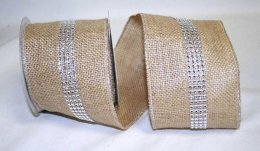 The Designer Burlap Ribbon with a Jewel Center & Wire Edge is ideal for your gift boxes, gift bags, craft projects and more! The Ribbon Diva carries a variety of Burlap Ribbons and Trims for all seasons & occasions. Browse our huge selection of Burlap Ribbon, we’re sure you’ll be impressed!